"Its an important mission of helping students everywhere feel accepted, included and valued by their peers,” says Andy Miller. “Every kid needs to feel like they belong somewhere, particularly at lunchtime." Veteran technology-industry CEO Andy M. Miller joined more than 30 of San Francisco’s top restaurants on Nov. 16 in supporting the second annual “We Dine Together” event, which raised funds for the San Rafael, Calif.-based non-profit group Beyond Differences and its “No One Eats Alone” program. Beyond Differences works with middle school students across the U.S. to organize the annual program, which promotes social inclusivity by teaching kids how to make friends at lunch. 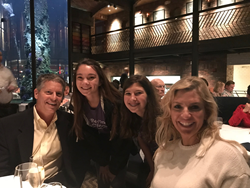 During the We Dine Together event, nearly three-dozen Bay Area restaurants donated tables for six to eight guests who also donated up to $500 each to enjoy a memorable dining experience with complementary wine pairings. All of the proceeds will go to support next year’s National No One Eats Alone Day, on Friday, February 9, 2018. Other participating restaurants included Alexander's Steakhouse, DOSA, La Toque, Zazu Kitchen + farm, J Bubble Room, Alfred's Steakhouse, Left Bank, Credo, flour + water, Terzo, Slanted Door, Lord Stanley, One Market, Jardiniere, Le Central, Salt House, Contigo, Wayfare Tavern, Park Tavern, Saison, Restaurant, Picco, EPIC Steak, Boulevard, Coqueta, Gary Danko, Delfina, Prospect, The Cavalier, Zuni Café, Town Hall, Sam's Grill, Barcino, Farallon Restaurant and Kokkari Estiatorio. Miller, who has served as CEO of Polycom and Tandberg, and in other senior positions for companies including Cisco, IPC Systems and Monster Worldwide, recently founded the Andrew Miller Foundation (AMF) to increase awareness and financial support for under-recognized charitable and non-profit organizations serving children and youth across the San Francisco Bay area. In addition to Miller’s own initial funding, the foundation plans to raise additional financial support from other donors, with all funds raised going directly to selected charities or scholarships. Donations to the No One Eats Alone program can be made at http://beyonddifferences.org/.